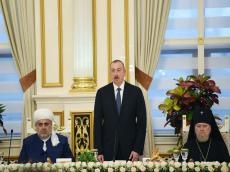 The "Baku process" is already an important part of the global agenda, said President of Azerbaijan Ilham Aliyev as he addressed an iftar ceremony. “It is no coincidence that the "Baku process", started on our initiative 10 years ago, is the only large-scale format of cooperation in the world. Over these 10 years, no one else has put forward a similar initiative. The "Baku process" is a purely Azerbaijani initiative. This year, we will mark the 10th anniversary of the "Baku process". This initiative is supported by the UN and other influential international organizations,” the president said. “The "Baku process" is already an important part of the global agenda. Look how many major events we have held in Azerbaijan over the years – the summit of religious leaders, the Global Forum of the UN Alliance of Civilizations, the Baku humanitarian forums, the forums on intercultural dialogue. We are doing all this because there is a great need for that. We want interreligious relations to be regulated at a high level not only in Azerbaijan but all over the world,” the head of state added.